This isn’t your average home makeover show. Design Therapy is a series where color and coaching go hand in hand. Host Kelli Ellis heads inside celebrity homes for room makeovers that extend beyond the walls and into the psyche of each guest. 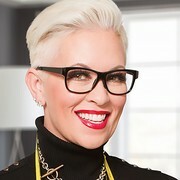 As both a designer and design psychologist, Kelli has an innovative approach that takes a deeper look at the “why” behind the colors, styles and furniture in each makeover.